being little • bristol uk fashion & lifestyle blog. : devon cream teas by post. Have you guys noticed this sponsor on the right hand side of this page...? If not, c'mon guys! Cream teas BY POST! What could actually be better?! I was lucky enough to be sent a sample of these cream teas a few weekends ago. 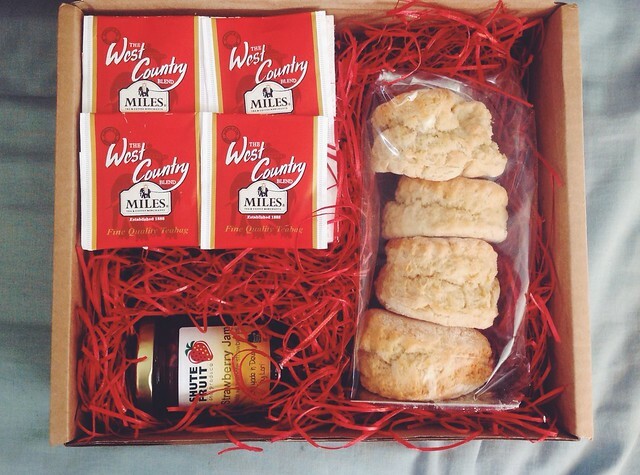 A little box filled with scones, jam, clotted cream and tea bags arrived on a Saturday morning, and had been consumed within about half an hour. Such a great idea, and lovely that they're actually from Devon too. It's nice to know I can have a delicious little bit of home when I'm in Bristol. This is THE best idea, off to order several for me! This might just be the most genius idea ever! Oh I love a cream tea! Best idea ever, which goes first though... cream or jam? Wow this is such an amazing idea! I'll have to take a look at the prices a bit later. That's such a cute idea! I've had a cake through the letterbox before but it hadn't even occurred to me that someone would be doing the same with cream teas!! !